Imagine perfect beaches backed by jungle-covered hills. Discover oceans teeming with multi-coloured fish, and jungles filled with an amazing variety of animals. Learn to surf on one of the most beautiful beaches in the world. Practice yoga in a completely relaxed environment. Enjoy the charm and beauty of the nearby towns. Eat delicious food with fresh ingredients and watch the sun set on the Pacific Ocean. 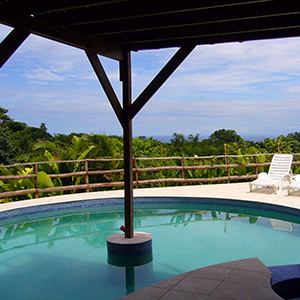 Costa Rica is one of the top five best real estate investment countries in the world. The Mal país and Santa Teresa area has a fantastic climate, diverse communities and is far from industry and pollution. The area boasts some of Costa Rica’s best surfing, snorkeling and diving and an incredible array of restaurants. This lot is currently one of our best deals, this is a large 2.85 Ha property with two big building sites, and A+ ocean views of the entire coast. This property is suitable for subdividing into 2-5 lots, for someone who wanted to build houses to sell, or it would make a great spot for a luxury villa. It already has power brought up to the top. Distance to the beach… 5 minute drive. Note, this is not on a public road. It’s on an agricultural easement, which means that you couldn’t legally do a hotel here. However, you could build houses or cabinas to rent.